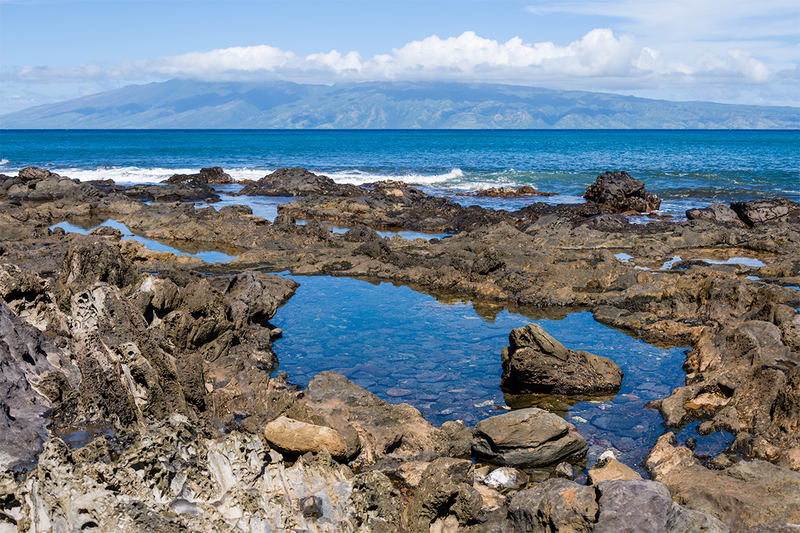 After my normal walk along the Kapalua Coastal Trail (ending with a barefoot stroll on Napili Beach), I have so many choices of what to do with my day. 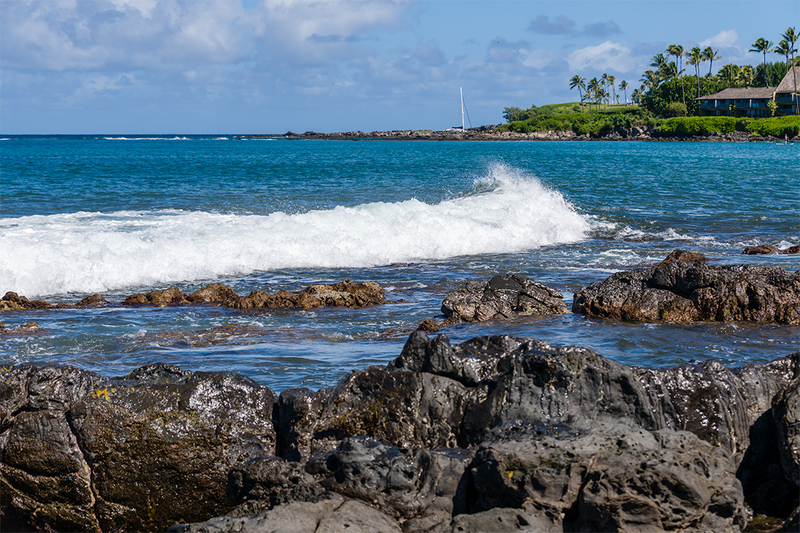 This fine Tuesday, I decided to grab my camera and just wander around Napili and Kapalua for anything that caught my eye. 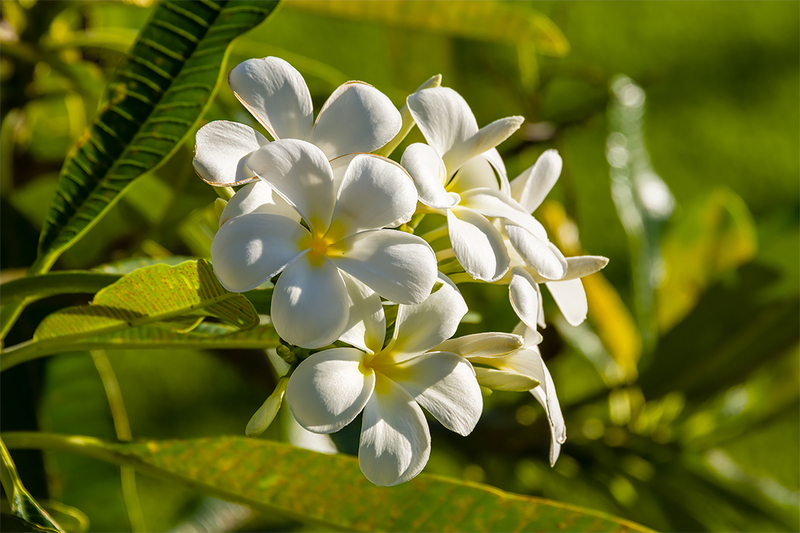 Plumeria will catch my eye every time. And the fragrant perfume they produce does the same to my nose. What a wonderful combination to enjoy when in Hawai‘i. I am sharing the image — wishing I should share the fragrance. It's mid-morning and folks were lined up to enjoy breakfast at the Gazebo here at Napili Shores. The restaurant opens at 7:00 am and folks from all over come to enjoy the treats such as pancakes (they are huge — try one each of banana, pineapple, and macadamia nut), Portuguese sausage (spicy) omelet, or the fried rice plate. The views are spectacular as you wait for your meal to be prepared and served. Once it arrives, you will end up stuffed to the gills. 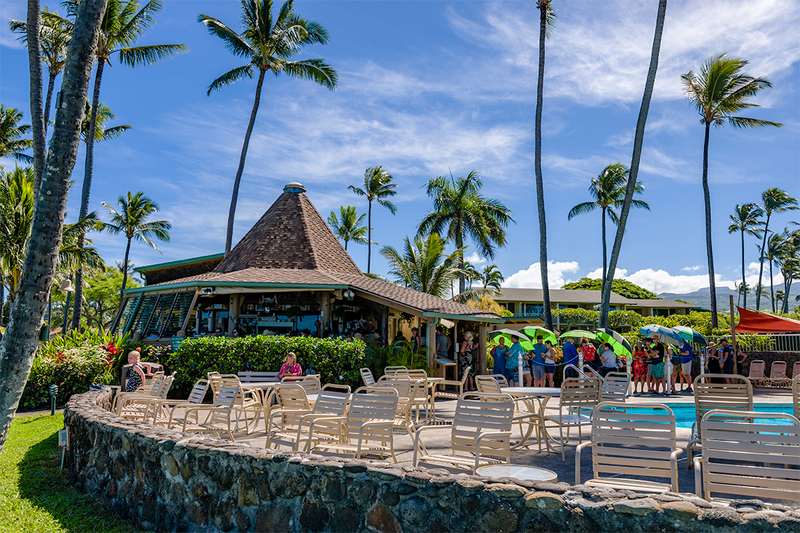 Here is a tip for those who are staying at Napili Shores — you don't have to wait in line — just call to place your order, skip the line, and pick it up 10 or 15 minutes later then enjoy it on your lanai. It tastes just as good as in the restaurant and if your room has a view (as mine did) — well, life just doesn't get any better than that. To the one side of the Gazebo, you have the view of Napili Beach. Generally, the mornings are somewhat calm, allowing for the young'uns to splash around without fear of big waves. 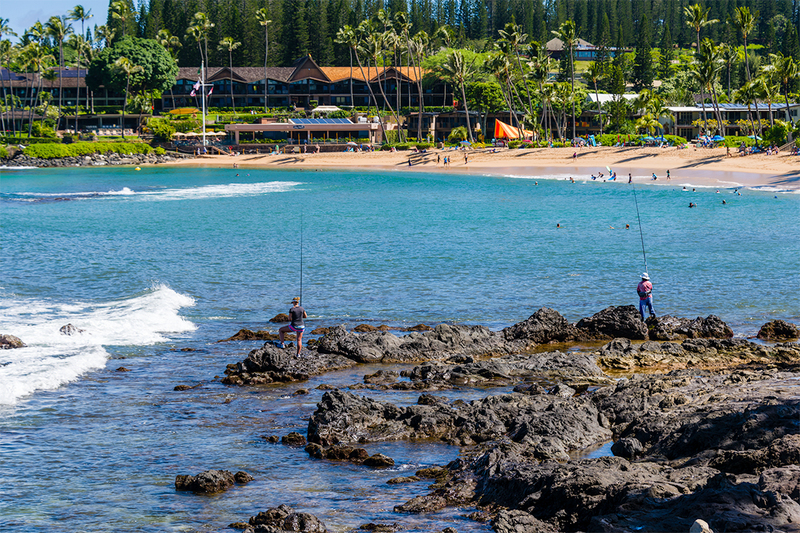 It also makes for good snorkeling, paddleboarding, and fishing. Later in the day, the surf will generally pick up — attracting the experienced boogie board and body surfers to get their rides in. Looking straight out you can see the tide pools in foreground, the Pailolo Channel, with Moloka‘i in the distance. Per Wikipedia, "Although the channel is only about 8.4 miles (13.5 km) at its shortest point, it is one of the windiest and roughest in the Hawaiian Islands". 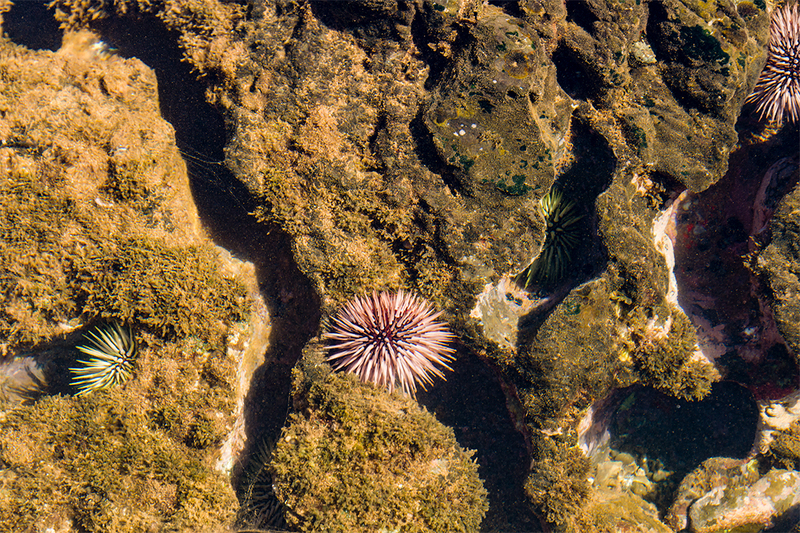 Put your flip flops on (I prefer my walking shoes) and venture out onto the tide pools. Just be careful with your balance — the old lava is hard and often sharp. But you will be delighted by what you might encounter. Sea anemones! They look like flowers. Notice how they settle down into channels in the rock. As prey move past the waving tentacles, a touch to a sensory hair triggers a cell explosion hurling a tiny harpoon-like structure at the prey, injecting venom which can paralyze. The tentacles can then pass the prey to the mouth — dinner! Some fish such as clownfish are immune to sea anemone toxin. I don't know if these fish are immune or just lucky so far. The water in the channels moves back in forth with the wave action — so they better be careful. 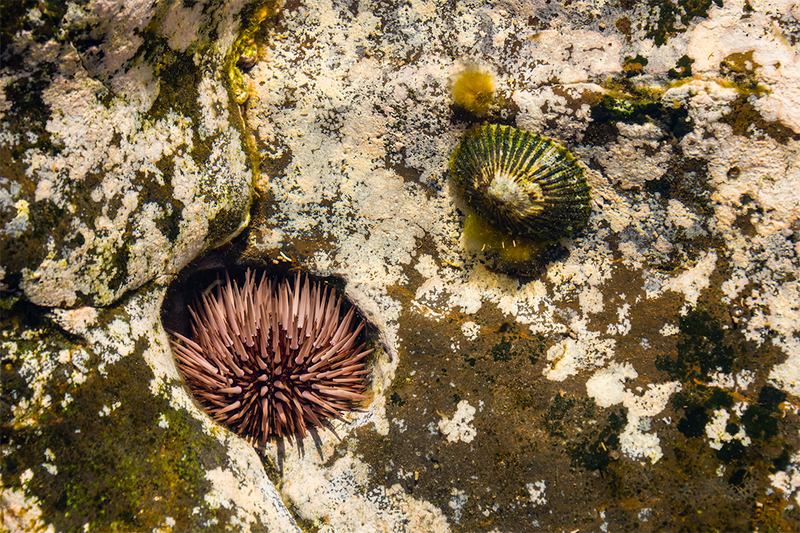 Most sea anemones are not harmful to humans — still, I would suggest you leave them alone, both for your own safety and comfort but also so other people can enjoy seeing them. When I was young, my parents emphasized to me that you never turn your back on the ocean — advice that I still follow to this day. 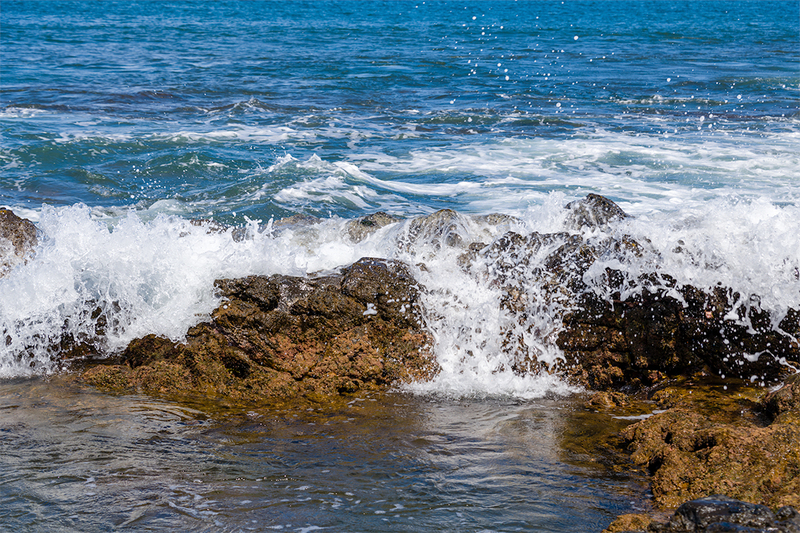 Fortunately, most of the time, the waves striking the tides pools here are relatively small. But if a surprise hits, you might not enjoy being knocked down onto the lava rocks. The wave action is almost like a washing machine — water flowing back and forth. 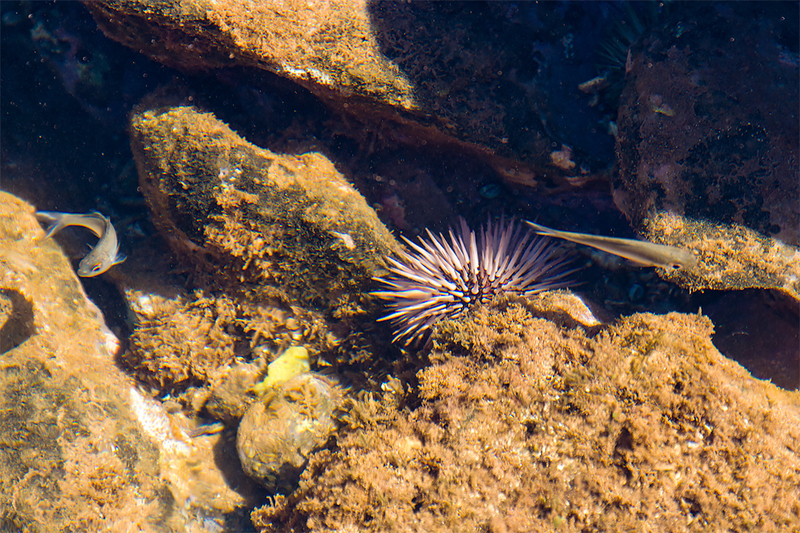 It moves both plant and animal life around so that the tide pools are a very active ecosystem. I like this description from Wikipedia — "Tide pools provide a home for hardy organisms such as starfish, mussels, and clams. Inhabitants must be able to deal with a frequently changing environment — fluctuations in water temperature, salinity, and oxygen content. 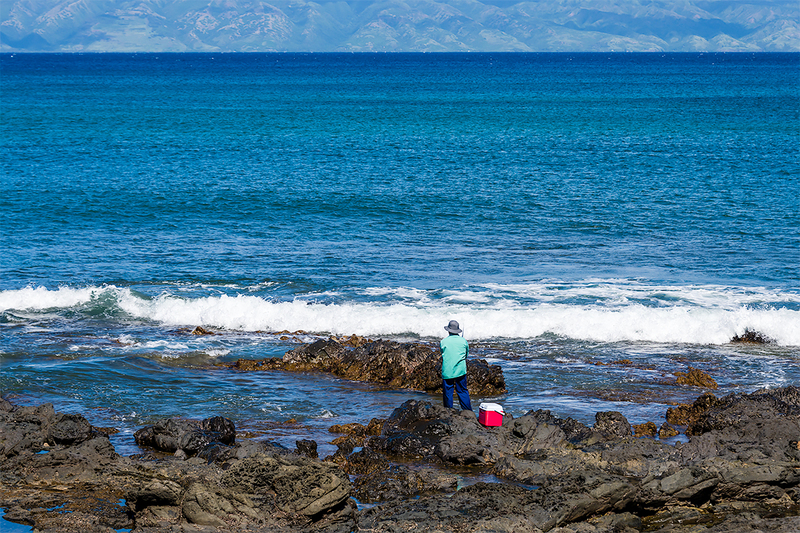 Hazards include waves, strong currents, exposure to midday sun and predators." OMG! This looks like an opihi sitting next to another sea anemone. Opihi is a type of limpet found in Hawai‘i. It has only one shell and clings to the rocks in a tide pool. It is edible and is highly sought after by locals. When I lived on Maui, I was invited to a local luau (non-commercial, celebrating a wedding anniversary) where they had opihi for us to enjoy. I tried them for the first time and I really liked them. 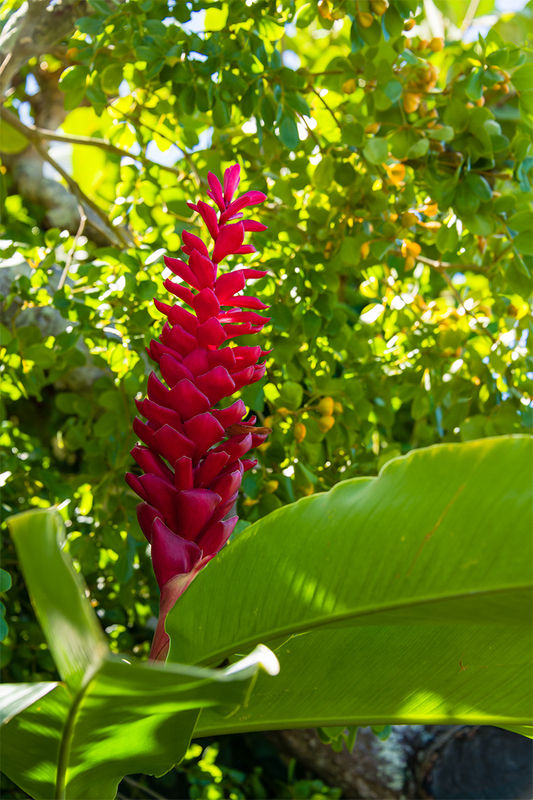 Looking up, I noticed this red flame ginger just to the side of the tide pools. Beautiful! What else is there to see nearby?